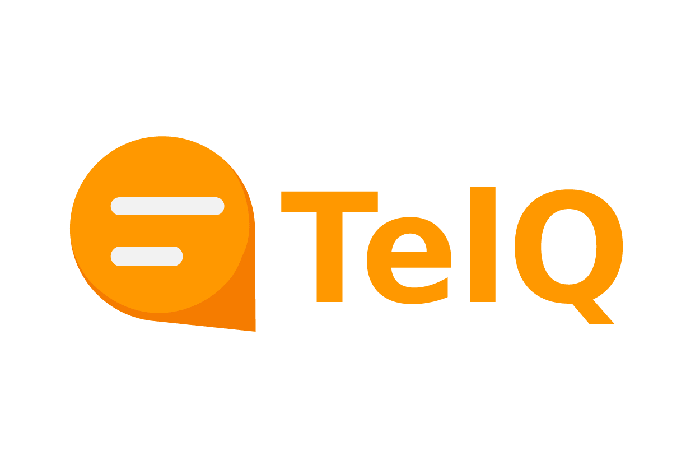 TelQ SMS testing platform allows you to verify, monitor and improve the quality of delivery of your supplier's SMS routes. Check out the full list of features which our platform supports. Send test SMS to our test numbers and check whether they are being delivered. Check which sender ID your messages are being delivered from. 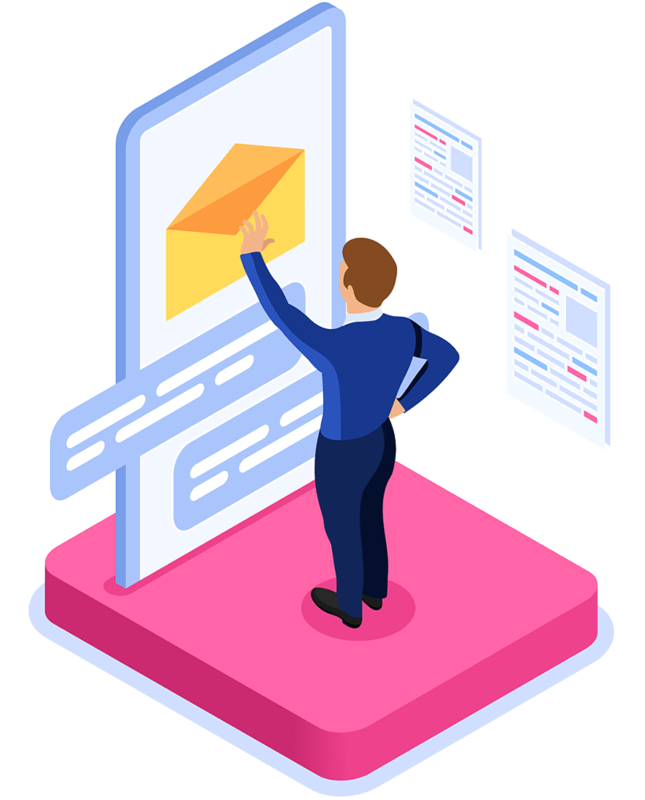 Verify the content of delivered test SMS. Check the SMSC from which your test SMS is being delivered. Check if your providers support mobile network portability. Specify the data coding manually and check whether they are being delivered correctly. Schedule your tests and automate quality monitoring process. Send test SMS with custom UDH and check whether they are being delivered correctly. Use SMPP or REST API to integrate directly with your system. Test how long it really takes to deliver test SMS to our SMS testing node. You can check if concatenation is supported correctly by your supplier. Get raw PDU of delivered SMS test message. Use different TON/NPI settings when sending tests via SMPP. 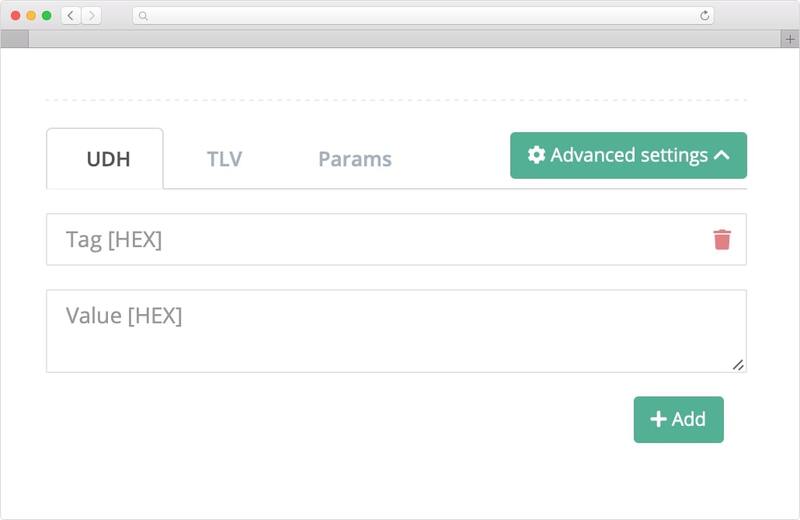 Use custom TLV parameters to route your traffic to the correct suppliers easily. Create reusable template test cases to speed up the testing process. Send test SMS to our local mobile handset test numbers and check if they are being delivered. 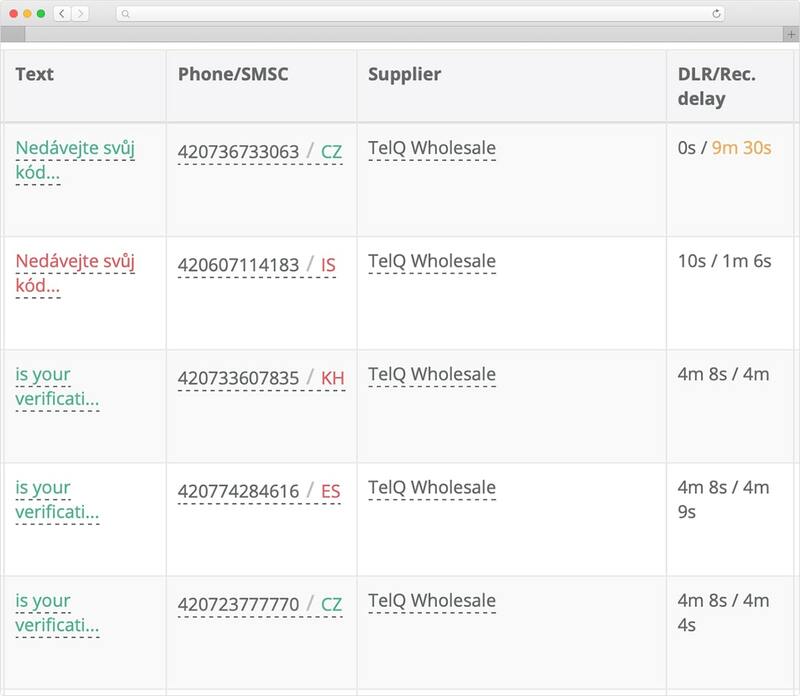 Compare the real receipt status from our handset with the delivery report of your supplier in order to identify fake DLRs and ensure optimal routing of your Bulk SMS traffic. Identify fake DLRs by comparing the SMPP status with the receipt status from our testing node. If your test SMS is delivered, but the Sender ID or content is replaced, you will be notified. You will be provided with a comparison of the text delivered and the text sent. This allows you to select the bulk SMS route which delivers content most relialy. Check what content your test SMS are being delivered with. Get notified if the content gets modified. 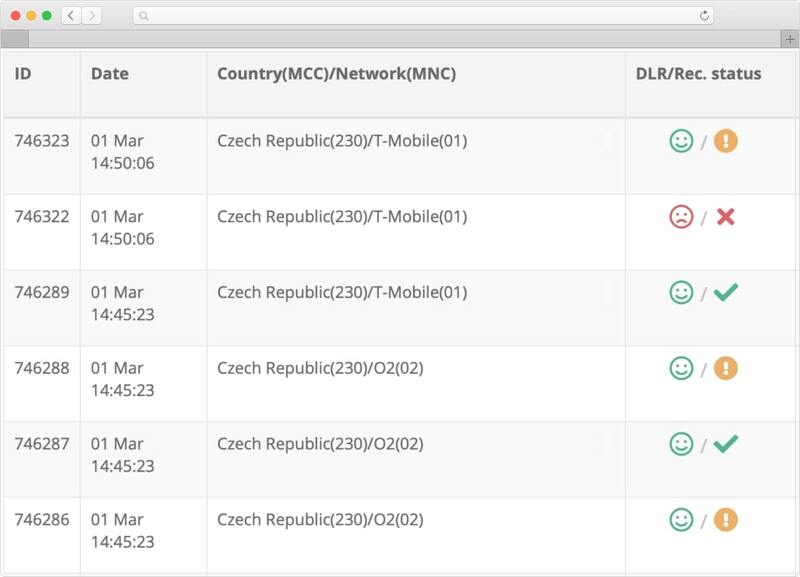 Check the real SMS sender ID features of your routes and what is actually being delivered on our local mobile test numbers. Check which sender ID your SMS are being delivered from. Get notified if your sender ID gets modified. Once the test SMS is delivered to our test number, we provide you with a raw PDU data of the received message. PDU provides you with the full technical details of the delivered message for an advanced analysis. For example, PDU allows you to decode the UDH settings of a delivered test. Get raw PDU data of delivered test message. PDU allows you to retrieve all the technical details. 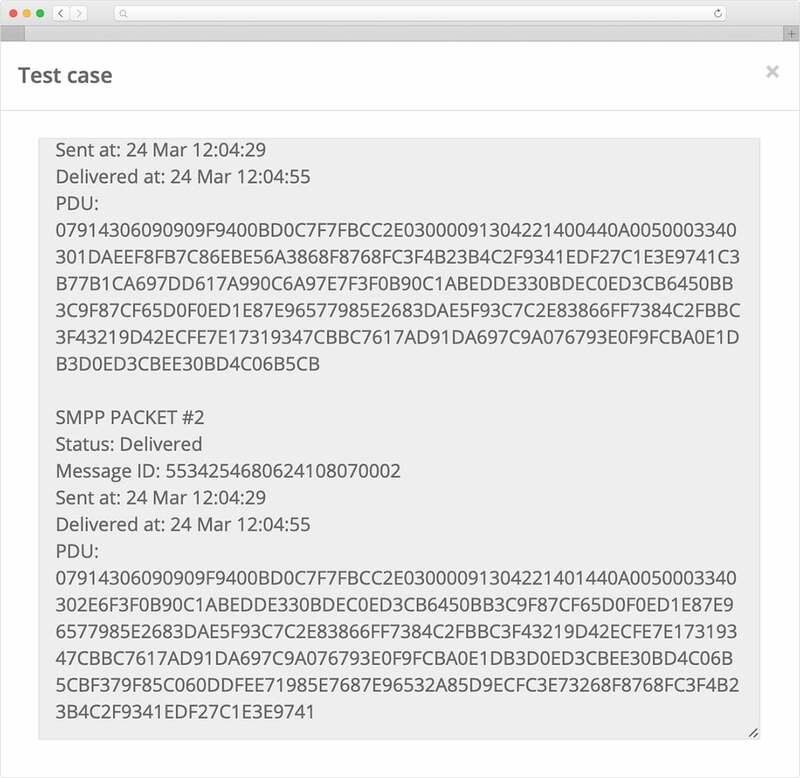 We can retrieve the SMSC information once your SMS test message reaches our testing node. This information can help you to determine the route type and potentially also the original provider of the route. We provide the exact SMSC number from which the SMS was sent. We perform an SMSC lookup and try to determine the SMSC owner. You can check the latency between the message being sent and the message being delivered to our testing device. You can also compare it to the DLR delay provided by your supplier. Check how long it actually takes to deliver SMS to handset. Compare receipt status delays to DLR status delays. Besides standard test numbers, we also allow our customers to send messages to the numbers which have been ported. 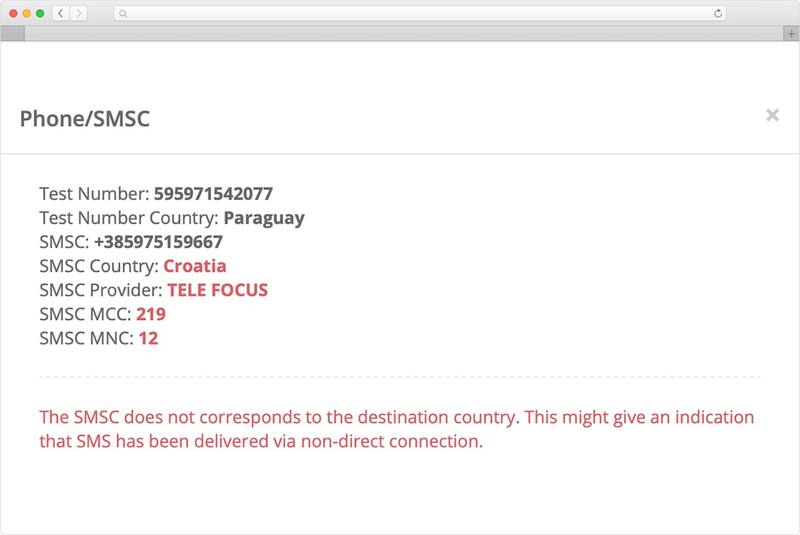 This allows them to check if their supplier can also deliver SMS to ported numbers. Compare delivery results to ported and non-ported numbers. If you would like to use more advanced settings, we have you covered. 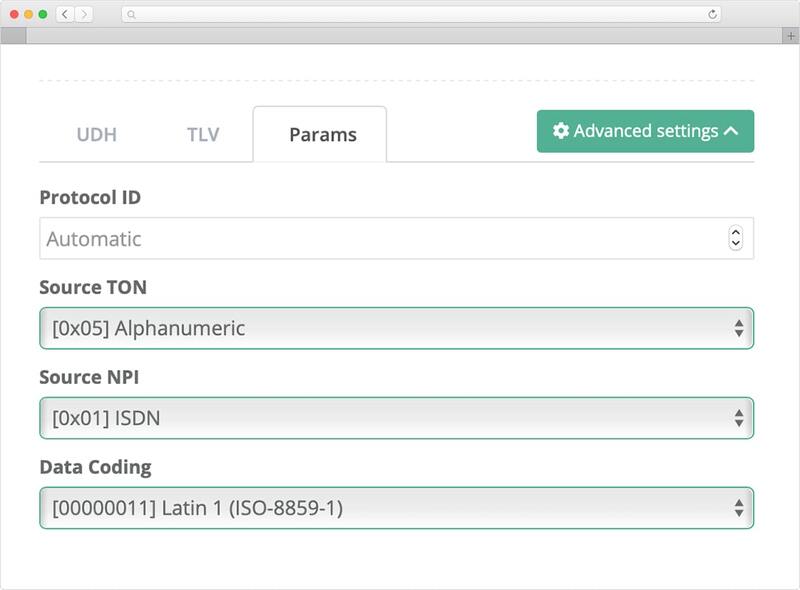 Pick a custom TON/NPI and Protocol ID as well as Data Coding settings when sending messages with SMPP protocol. 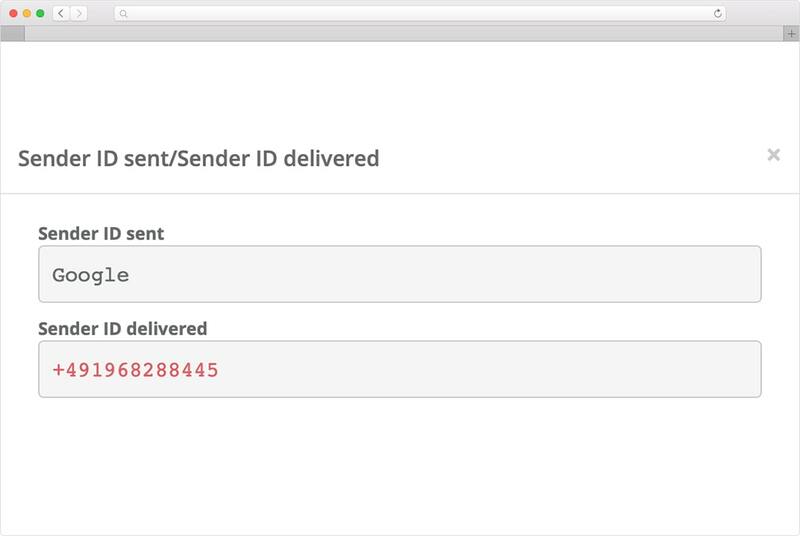 Use custom TON/NPI settings for your sender ID. Use custom data coding for your content. 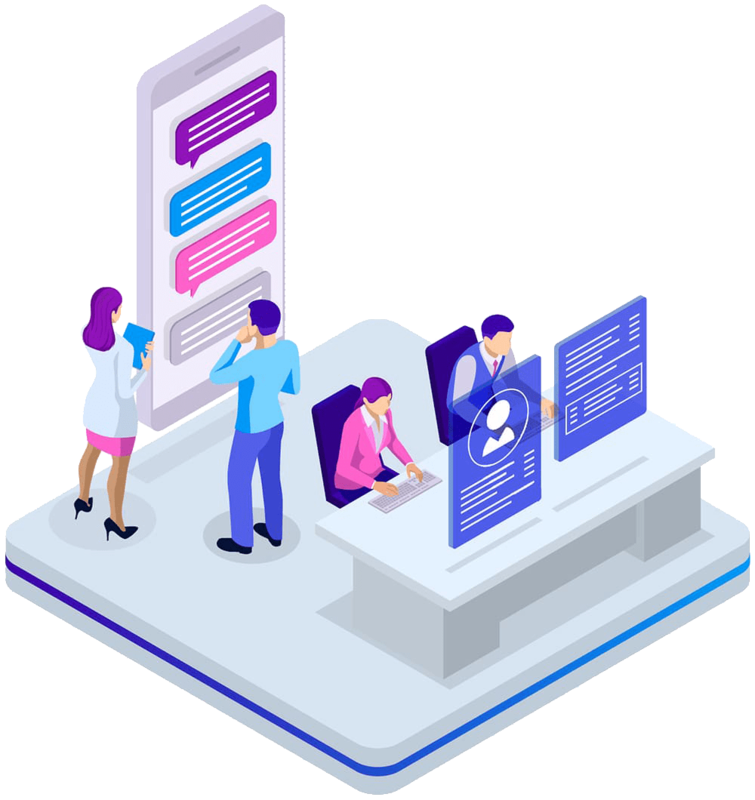 UDH settings allow you to test the advanced functionality of your supplier's SMSC, such as the support of silent SMS used by Apple and some other companies. Send test SMS with custom UDH and decode the results from the PDU. Send test messages with custom UDH settings. Check what UDH delivers by decoding raw PDU data. 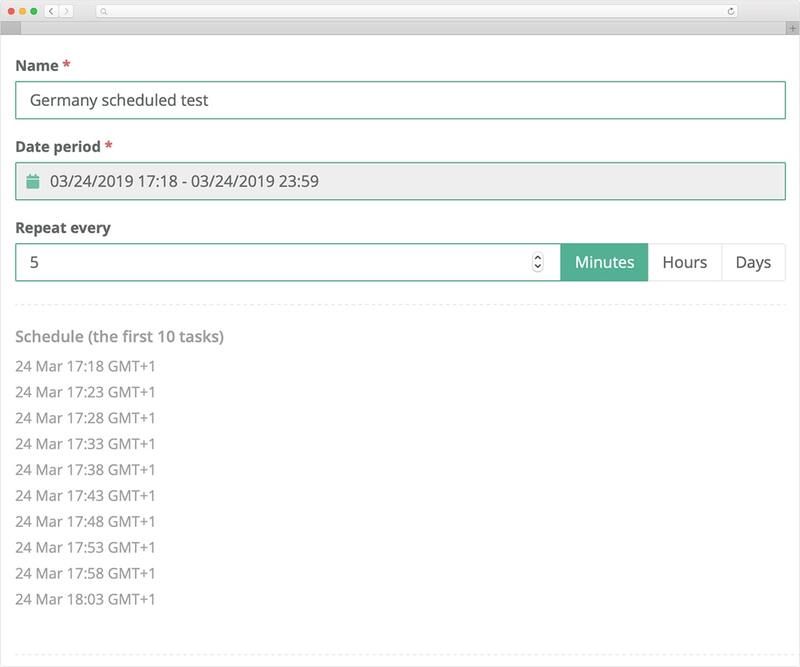 You can schedule tests to be sent in certain intervals and receive custom alerts if certain delivery criteria are met/not met. 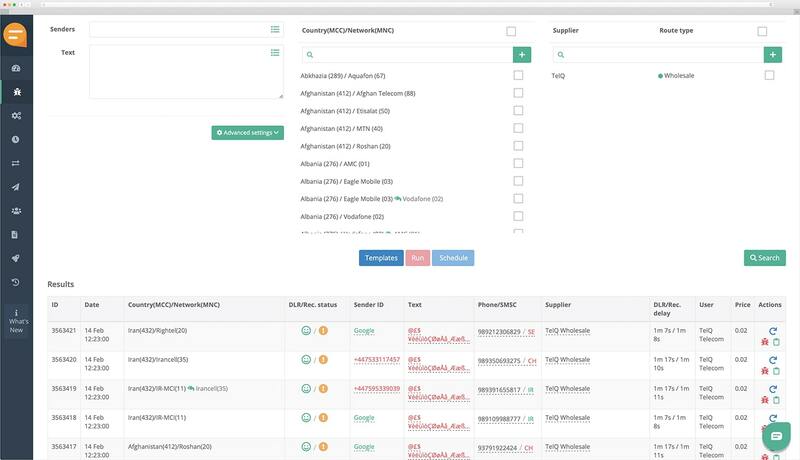 Test scheduling allows you to automate quality monitoring of critically important routes. Schedule predefined tests at regular intervals. Get alerts if tests do not deliver or some other criteria are not met. If you frequently send tests with particular sender ID or content, you can save them as a template for future use. You can also upload your templates from excel or use existing common templates that we created. Create reusable custom sender ID templates. Create reusable custom content templates. Explore the main functionality of live number testing. 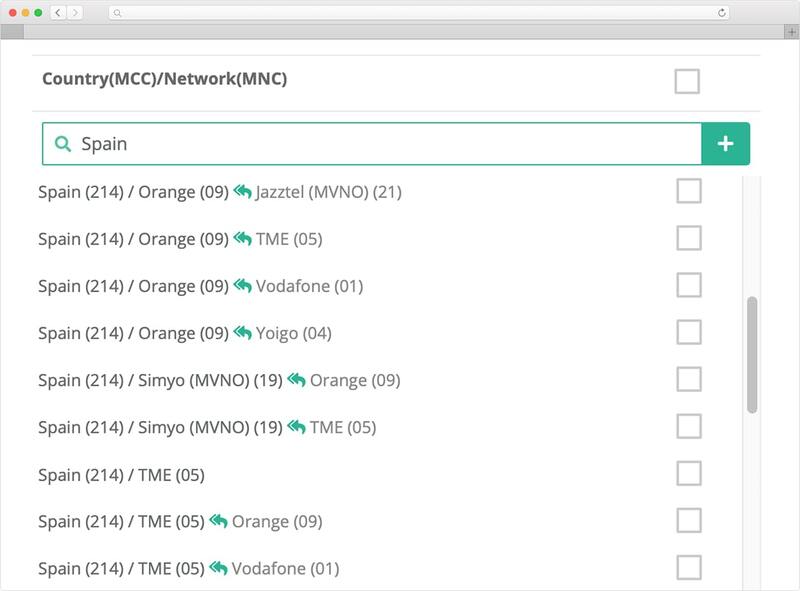 Watch how to send test SMS from our SMS quality testing tool. Find working bulk SMS routes. Test all of your suppliers and find the routes which suit your needs and deliver at the lowest price. Send tests and check what actually delivers at the lowest price. Detect grey routes based on the sender ID and SMSC information. Monitor providers you decided to route in to make sure they are not failing. Receive alerts if something goes wrong and you need to reroute the traffic. Delivering test SMS is just the first step. You need to ensure that all the necessary features are supported and your subscribers receive the SMS the way you want. Check if sender ID and content delivers properly. Make sure messages deliver on time. 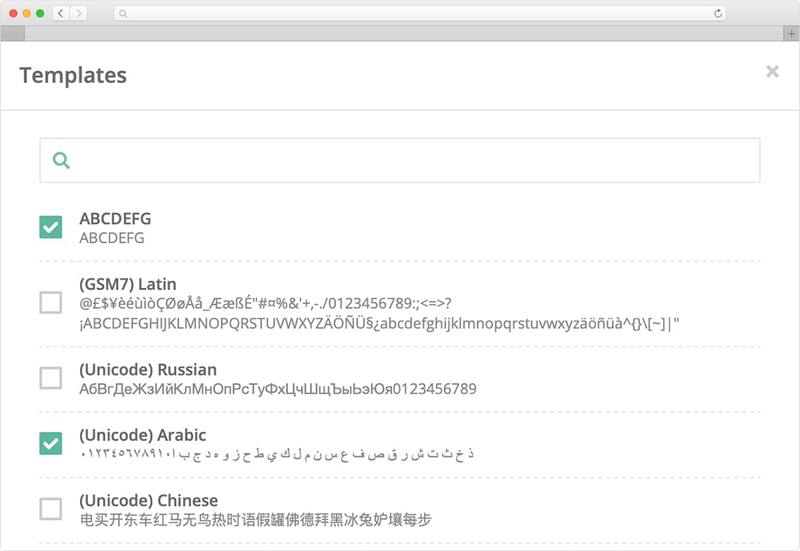 Test the delivery of content with different data codings: GSM7, Unicode etc. Check if your supplier supports the delivery of long messages. We provide a wide range of flexible integration opportunities. 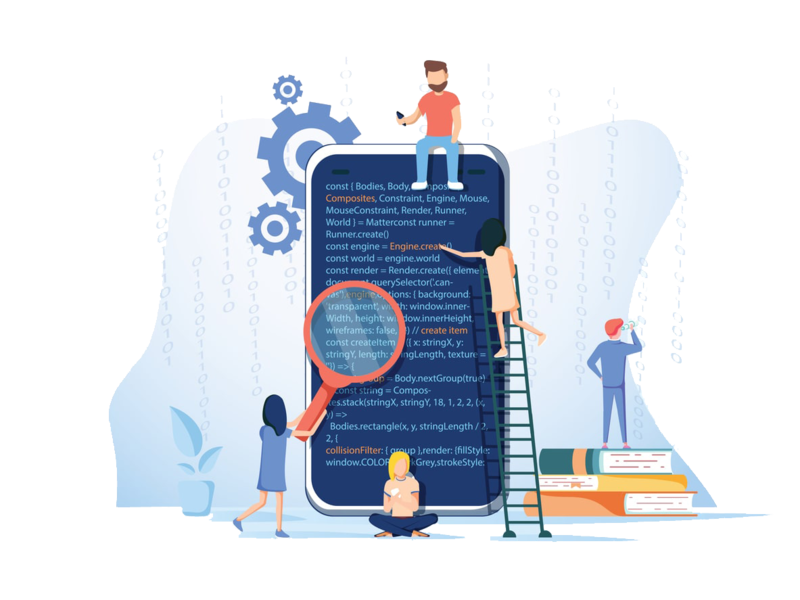 Our robust APIs enable you to automate SMS testing process by integrating directly into our system. Adjust your automatic routing system based on the delivery of tests to our test phone numbers. Integrate with SMPP API directly with your server and start sending test SMS to our test numbers directly from our user interface. You can also integrate directly with your system via REST API which allows you to access the coverage, test numbers and test results. If you are using Alaris Labs SMS tool, you can integrate with us directly and send tests from Alaris' user interface. You have an option to select prepaid or postpaid payment terms, depending on your needs. If you have more questions, please check out the following sections. The following section answers the most commonly asked questions. If you do not find the answer, please don't hesitate to contact us. We've made several video tutorials which will help you out to get started and understand the main functionality of our testing platform. 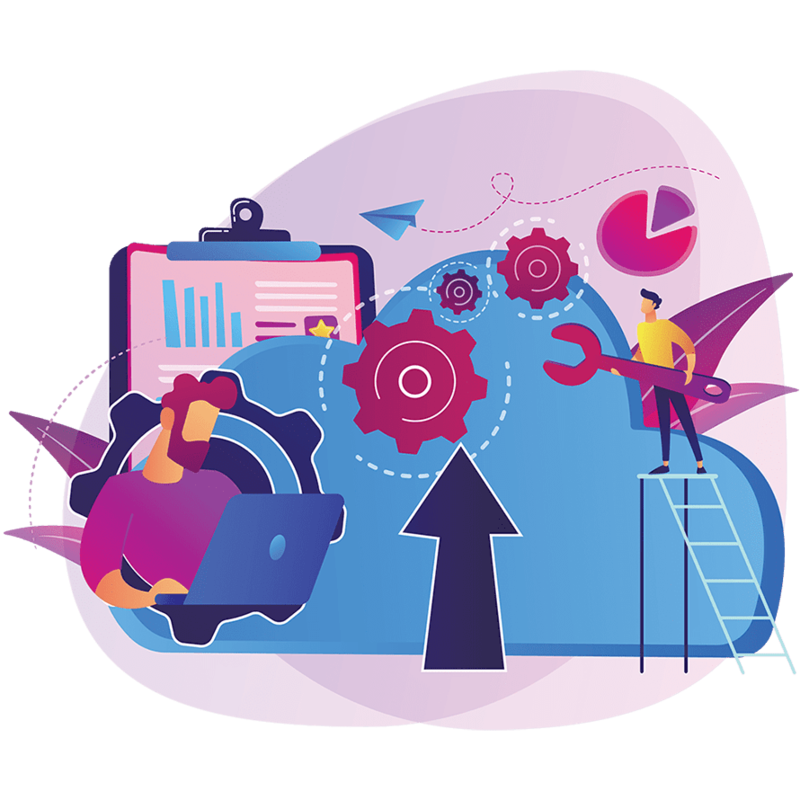 Our REST API allows you to integrate directly into your system and completely automate your quality control process. Here we provide a general overview of the integration process with our platform.